What is the most controversial topic in preparedness? What subject can you deliver an opinion on that will almost certainly start a passionate discussion? It can be nothing other than the subject of weapons. No one denies that weapons have their place. Whether for defense or for hunting, weapons should be part of everyone’s preparations. The difference in this discussion is that the focus will be on everything but firearms. Gunpowder weapons have their place, but because for several reasons, non-gunpowder weapons are an important long-term choice in your preparations. For a start, they depend on availability, which can be an issue in Canada. Permits are required for the purchase of firearms and ammunition. Secondly, they require an ongoing supply of ammunition, which means you need an assured source. Even if reloading, you need a supply of components. Either way, the supply is finite. A large, expensive stockpile of ammunition with thousands of rounds, while possible, is far beyond the reach of most preppers. Third, you can’t make a gun or its parts, as that sort of manufacturing tends to be very complex. Most of the options we’ll discuss can be made with limited tools or no tools at all in some cases. Fourth, they are noisy. A gunshot can be heard a long, long way off. I can envision quite a few survival situations where I’d rather not advertise my presence to animals or people. Finally, firearms are often a remarkably inefficient way to use manpower. Yes, that’s right, I did say that. As a method of obtaining food, trapping and fishing are the best bang for the buck, if you’ll pardon the pun. You can set multiple snares, traps, lines or nets, effectively magnifying your efforts many times. You just can’t do that with a rifle. Still, whether for hunting or defense, weapons are necessary, so let’s look at the non-firearm options. These weapons break down into two general classes: Those that derive their effect solely from human muscles and those with some sort of stored mechanical advantage. The first group consists of stones, throwing sticks, knives, spears, slings and so on. The second group is mostly populated with bows of various types and slingshots. I personally feel most of the first group are unlikely to be effective as a defense if facing an opponent armed with any sort of firearm. Either the lethality or range is not sufficient for that task. That said, let’s look at how they shape up as hunting weapons. Stones: Seems silly, but I have seen a well thrown stone knock down squirrels, rabbits and birds. I hasten to add that the skill was not mine, but a skill certainly achievable by most people. While not the best choice (after all, humans invented better weapons! ), the humble rock is almost always available, takes no construction, and requires no more practice than anything else. Throwing sticks: a weapon used successfully as a hunting tool for millennia. 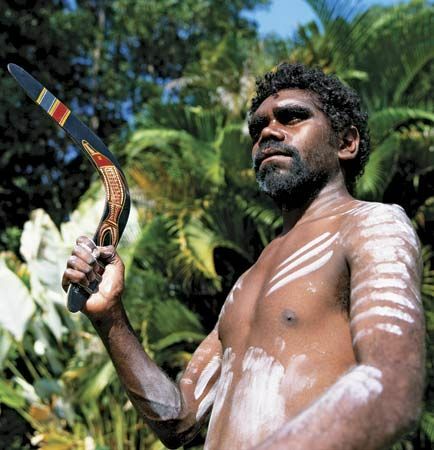 Probably the best-known example is the boomerang, once used to hunt animals as large as kangaroos. I’ve personally knocked down turkey with a throwing stick, and it’s surprisingly effective. It can be as simple as a hardwood stick or as elaborate as an Apache throwing star. Knives: Whether a stainless steel Bowie knife designed to turn 1and 1/2 revolutions in 22 feet, or a chipped flint knife, I think knives are the trickiest of the thrown weapons to use. Due to the necessity of hitting the target point first, unlike a stone or stick, they require more practice. As they generally are ineffective beyond ten to thirty feet (depending on knife type and style of throw), I’d rather throw a rock or stick, which have just as good of a range. Also, the thought of scrambling around in the brush looking for what might be my only knife after throwing it at a bunny and missing is a daunting thought. Spears: While watching Brad Pitt as Achilles spit some unfortunate at a distance seems to indicate that the spear is a throwing weapon, it has been used far oftener through its history for stabbing. As a throwing weapon, it is not that long ranged (the world javelin record is under 100 meters, and javelin throwers are going for distance, not accuracy), but somewhat superior to the knife in that it is generally more stable in the ballistic sense. The pointy end almost always gets there first. Atlatl:. A longer ranged, (and with practice) more accurate version of the spear. Basically a carved stick giving you more leverage to launch what are essentially oversized arrows or miniature spears. It takes time and lots of patience to get good with this. Finally, we have the sling. Arguably the simplest to make, and can be made from a huge variety of materials. It is essentially just a pouch for holding a rock and a string on each end. While requiring some skill to use, it is potentially the longest ranged, most accurate and most lethal of this class of primitive weapons. It comes in two varieties, the ordinary hand type and the larger staff sling. Again, it requires some time and patience to get good with this, but can be a valuable addition to your hunting arsenal. With a little practice every day, any one of the weapons mentioned can become a valuable addition to your ability to survive. You may not be equipped with the latest and greatest firearm, but if you’ve a proper survival attitude, and just a little time to practice, you need never be unarmed.